The history of the Lyn Ott painting that became this special edition giclée is long and interesting. Painted in 1976, Out of Fathomless Depths was one of the last Lyn did alone before losing his eyesight and attending classes at the South Carolina Commission for the Blind. In 1980, the enormous striking blue painting became one of the seventeen images Lyn selected to include in his only published book, In Quest of the Face of God. It is image number 5 on page 23. In 1980, in the last year of Elizabeth Patterson's life, a relative of Elizabeth saw the painting in the book and suggested to Elizabeth that it ought to be obtained by the Meher Center. Jane Haynes, who was then taking over duties managing the Center, called Lyn on the telephone and urged him to loan it. Lyn agreed to do so for an indefinite period and it adorned the Meeting Place for 35 years. Elizabeth died in 1980. Jane died in 1997 and Lyn the following year. Another 17 yers passed. Then in 2015, by an agreement reached between Phyllis Ott and the Meher Spiritual Center, the painting was at long last returned to the Lyn Ott Estate. The painting was of great importance to Lyn himself. 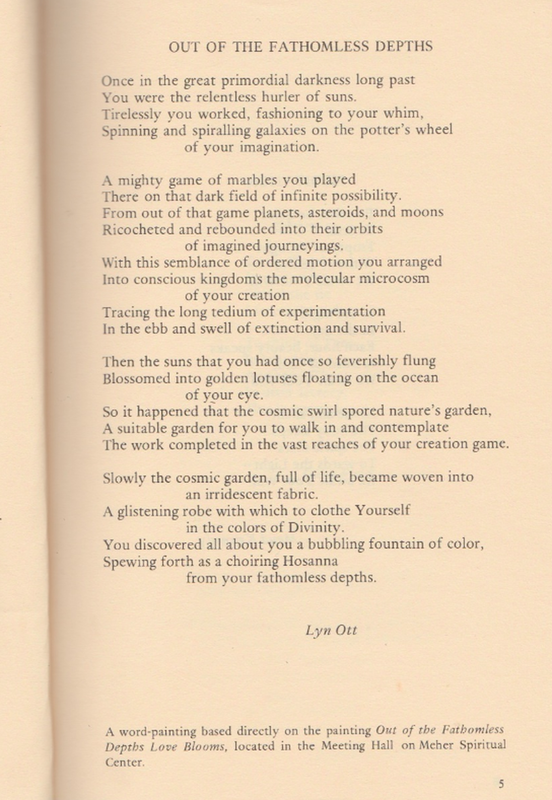 In 1985 Lyn published a poem in the Manifestation, Inc. book Poems to Avatar Meher Baba, appearing on page 5. Beneath the poem editor Steve Klein wrote, "A word-painting based directly on the painting Out of the Fathomless Depths Love Blooms, located in the Meeting Hall on the Meher Spiritual Center." 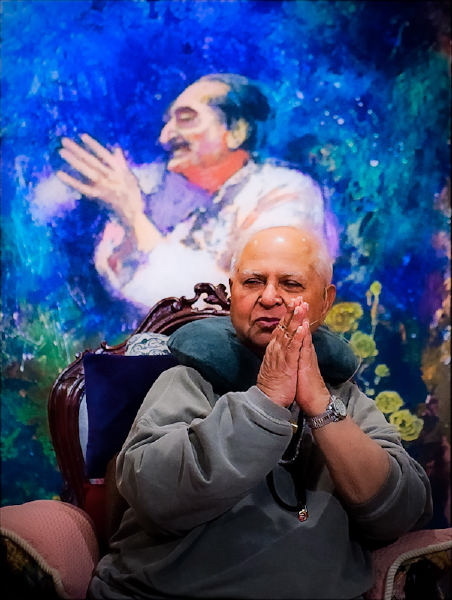 The painting itself is one of the most familiar of Meher Baba in the world, due to its several decades presence in the Meeting Place on the Meher Center in Myrtle Beach. It is now available to everyone in canvas prints, beginning with a limited edition (50 of 50) life size giclées. Bhau Kalchuri salutes the audience in the Meeting Hall before Lyn's painting.